After the crash and subsequent breaking up of the M/V RENA in New Zealand, I worked as part of Titan Salvage's response team to bid the wreck removal from the sensitive reef area. 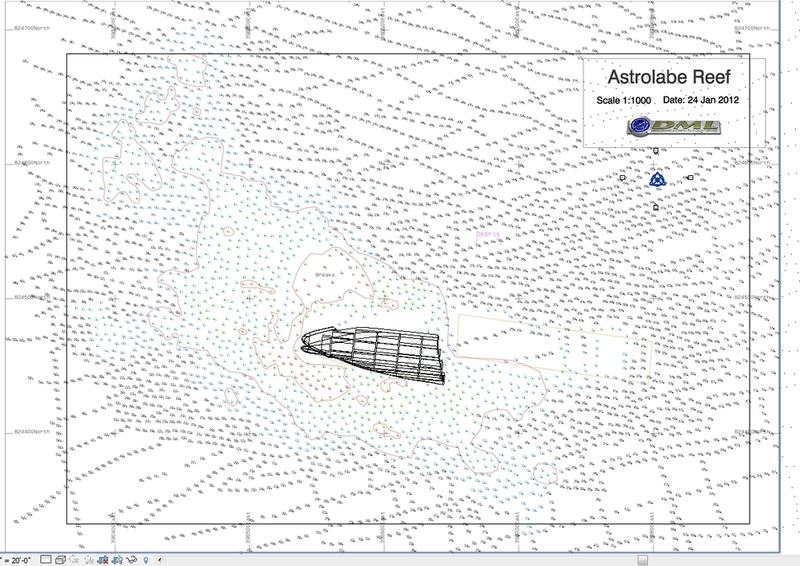 The main challenge of this salvage plan was the the extremely shallow water surrounding the vessel on Astrolabe Reef. The water depth was one to two meters in all but a few places, making it extremely difficult to get any type of large crane vessel near the wreck. With this in mind, and with the dramatic images of helicopters pulling containers off the wreck, we had to find a suitable vessel with enough crane reach to come close enough to do meaningful work. I then drafted up our solution and proposed vessel choice in a 3D model that was used in our bidding process. Having found a way to bring a crane and scrap barge close enough and rendering solutions for this. We were able to turn the full bid, including renderings and feasibility studies within two weeks, an impressively short period of time for such a complex wreck removal. Although we did not end up winning the contract, we produced a coherent and clear bid with strong technical in a short period of time.